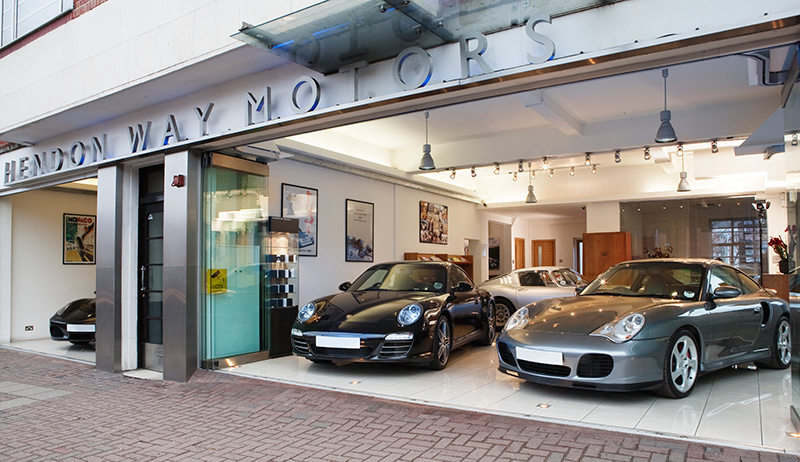 Hendon Way Motors has not signed up to be either Authorised Porsche Agent or Ferrari Dealership but has held out for independence. We sell cars here that we are enthusiastic about. We love E-Type Jaguars and AC Cobras as well as Ferraris and Porsche, we also appreciate the importance of a car like the Lamborghini Diablo SV as a development of a car designed in the early 1970s with the first Countach. When you enter our showroom you will be in two worlds at once, along side the brand new 996 Porsche lies a 1966 Cobra 427, alongside the Turbo 4 sits a 1936 Bentley, the walls are covered not in advertising, but in racing cars and events we have competed in. We are first of all car enthusiasts, who have developed a complete service for you, the next owner of a classic sports car.